OBECTIVE: To fly an Am-FIB for a TV series exploring Cape Verde Islands, Zanzibar, Mauritius, Madagascar, and São Tomé and Príncipe, from mid 2010 to early 2011. An archipelago of rather arid volcanic islands about 300 miles off the coast of West Africa. Originally a Portuguese colony, became an independent nation in 1975. Rather windy. Journey completed in June - July 2010. Ancient Arab trading and spice islands off the coast of East Africa in the Indian Ocean comprizing the main island of Unguja and Pemba to the north. The people and culture is predominately Muslim, the islands became independent from UK in 1963 and joined with Tanganyika to form a semi-autonomous part the United Republic of Tanzania in 1964. Journey completed in September 2010. An island nation in the Mascarene group of islands off the coast of Africa in the southwest Indian Ocean, about 900 km east of Madagascar, became independent from the UK in 1968. Approximately half the population is Hindu but the main languages are French, English or Mauritian Creole. Sugar is the predominant agricultural export. Famous for having been the only known home of the dodo. Journey planned for October - November 2010. The World's fourth largest island in the Indian Ocean off the southeastern coast of Africa. Annexed by France in the late 19th Century, became an independent nation in 1960. Famous for its unique fauna and flora. Journey planned for November - December 2010. 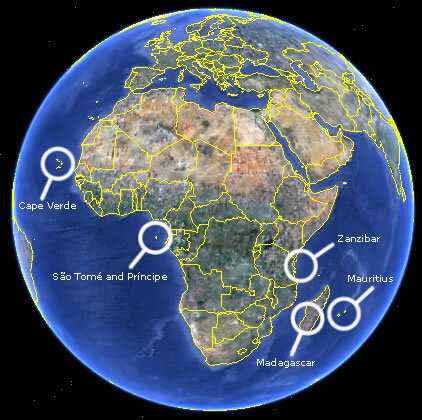 Africa's second smallest nation; two extinct volcanic tropical islands off the coast of west Africa, more or less on the equator. Originally a Portuguese colony, became an independent nation in 1975. Journey planned for January 2011. The Polaris Am-FIB is a unique combination of a microlight trike and a semi-rigid inflatable boat (RIB) to make a Flying Inflatable Boat (FIB). We are using the amphibian variant, hence Am-FIB. With a top speed of about 65 Km/h, performance is un-spectacular and in all truthfulness it is a bit of a contraption, but for all that it is very well proven and and has the unique characteristic of being able to operate from land or water, which is just what we need for these expeditions. Considering that it has a huge 19 Sq. m wing on a rather small boat, handling it a low speeds on water can be tricky, but it will take off and land(?) on surprisingly rough water. The trike is stainless steel, but great care has to be taken to keep the wing structure in good condition in a marine environment. It is fitted with a Rotax 582 two stroke engine which keeps things nice and simple, and an Arplast three blade prop. This film from youTube gives you an idea of what an Am-FIB is all about. MARITIME AFRICA takes us on a five-part journey to the islands around Africa, the so-called Gates of Heaven. The team comprizes the pilot of the FIB and a World renowned photographer, their objective: to capture unique images of Africa’s islands from the air and from the ground for a coffee table photo book. The adventure starts on each island with the search for the perfect flight destination. Their FIB is the number one topic all over the island – at market places, in harbour cafés, amongst fishermen and vendors. They take the photographer to places he has to see from above: the cleared steppes of Madagascar dotted with thousands of zebu cattle, the precipices of the Le Morne Brabant on Mauritius, the equator which runs right through the fishing islet of Rolas south of São Tomé. Some of those pictures seem to be the work of an artist. On his search for the best aerial shots, the photographer meets the islands’ people – they introduce him to their culture and offer an inside perspective of the country. Natural wonders, traditional ceremonies, manners and practices – in search of authentic images we dive deep into the soul of the islands and their population. Each journey always begin with a search and often ends differently than expected. The Gates of Heaven, the gates to Africa – a world that is unique on this planet. How have we been getting on in the gates of heaven? Keep an eye on this website for the latest news! Was the first person to fly a microlight from London to Capetown in 1985/6. In 2004 he flew over Mt Everest as part of an expedition to tow the Italian pilot Angelo d'Arrigo in a hang glider to the summit. He towed Angelo over Mt Aconcagua in Argentina, the highest mountain outside the Himalayas in 2005. In March-April 2007 he flew with blind co-pilot Miles Hilton-Barber from Rhodes to Sydney, Australia and in 2008 flew over Kilimanjaro. He has been World and European microlight champion and has been awarded the Royal Aero Club gold medal and the FAI Gold Air Medal. He lives in England 50 Km north of London. He lives in New Caledonia. Matthias attended the Bavarian school for photography in Munich from 1988 to 1990. After his training, he has developed with reports from around the world. His work have been exhibited widely. He has worked for renowned magazines such as Stern, Spiegal, SZ magazine, Mens Health, Geo, Greenpeace Magazine, Vogue, L'Uomo Vogue, GO USA, Time Magazine and others. World customers: BMW, Strellson, Marc O'Folo, Deutsche Bank, DWS, UNICEF, Thyssen Krupp, VCI, etc.